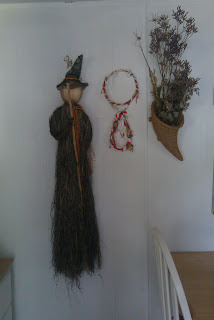 Here are just a few of my witches. Some I have at work and cannot take pictures of as we aren’t allowed phones and cameras inside. Maggi over at Letting Go is Flying gave this to me several years ago. I’ve always loved her! Thanks Mag-a-boo! My friend Megan, who I’ve unfortunately lost contact with 😦 gave me this witch and one for herself so we have matching witches!!! I even like her greenness! I do so miss Megan and have thought about her half a dozen times this month. I may have to try and find her! Will go through old records at home tonight and see if I can find her email. This is my house witch Ismeralda Zelda! I found her at a clearance sale when a business in town was closing at least 8 years ago and she instantly told me to take her home. 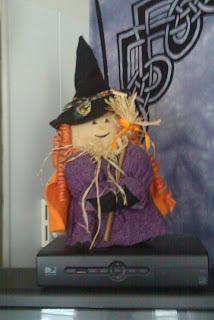 She has been my house witch ever since. Next Ismeralda are two Beltaine wreaths and flowers from my 1st degree initiation in the cupola. 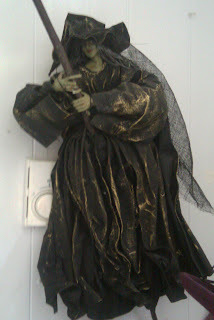 I hope that the rest of my witches are in the boxes I have STILL NOT unpacked because I would be very sad if I have lost them. 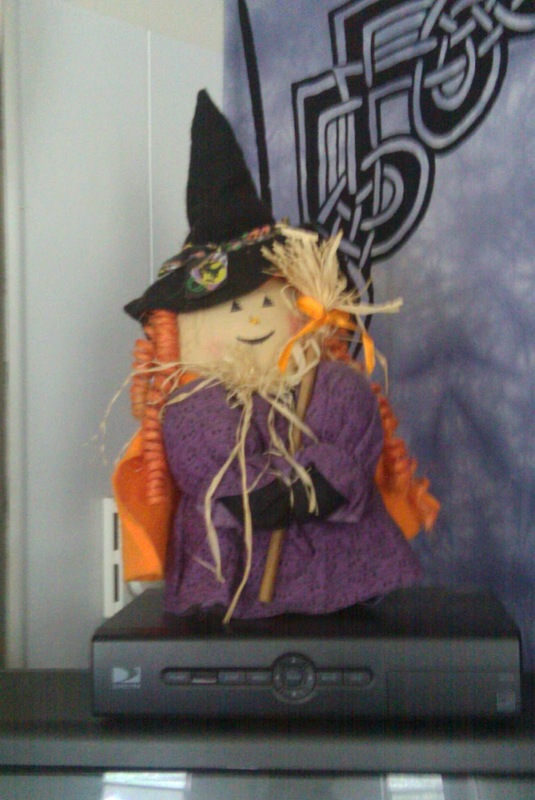 I also have a knitting witch where she is holding knitting needles and a knitting magick book, a catwitch in a flowerpot holding a broom, and a witchon a box at work. This weekend was absolutely lovely. Saturday I spent my morning cleaning house like crazy. I was sooo tired of how cluttered the place looked. OMG it looks so good right now! I am hoping I can keep it up. It is very much spotless which is totally amazing! That night I had a fantastic date with someone I met at an online dating site. We will prolly have lunch sometime this week. And mother’s day was quiet and peaceful. Ended up sleeping in wayyyyyy late 😦 Which I was not happy about, but I just couldn’t make myself get out of my cozy bed cuddling Lucy! But eventually I did manage to get up. Talked to my mom, she is doing pretty good but my cousin is getting worse! I hate that I am here and can’t help and she has to wait for insurance to get their heads out of their collective asses. Both of my kiddin’s called. My girl wanted to bake me a cake so we’ll do that this weekend when it is just us. I think it is some time for some serious M&M time. I miss that soooo much. The boy seems to be doing pretty good. He has an appt with a behavorial specialist Thursday. So we are getting closer and closer to getting him better! This weekend he has ROTC Challenge so he’ll be out of town.